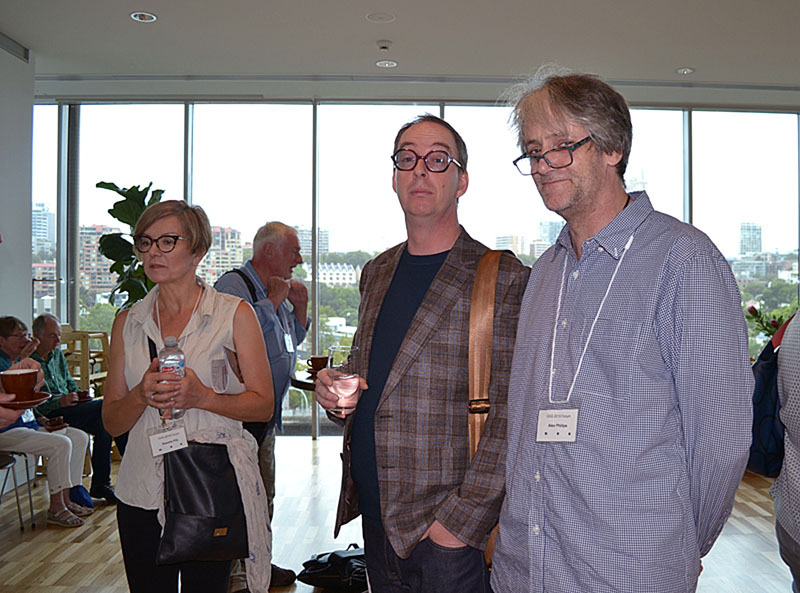 The 2019 Oceanic Art Society Forum was an intellectual and emotional odyssey. Oceanic art represents and encompasses many things: sublime beauty and irresistible mystery; cultural treasure; markers of colonial dispossession and loss, but also continuity and hope. That indeed is what Oceanic art is: objects that bind people through time; binding those who made them to their current descendants; to the ancient stories; to the land and waterscapes, and also to the members of the wider human family motivated by intellectual, emotional and aesthetic curiosity. 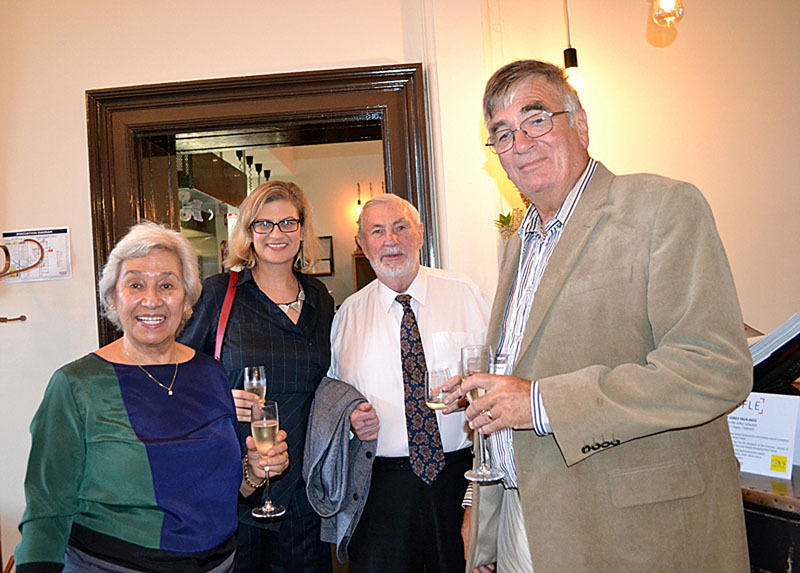 (L to R) Esther Jessop, Dr Maia Nuku, Key-note Speaker, Jeffrey Jessop and Dr Bill Rathmell, President of the OAS at the 2019 Forum at No.10 Bistro. Photo courtesy Jerry Liew. The Forum was fundamentally curatorial driven: all eight sessions were presented by speakers who are professional curators at a variety of institutions. Furthermore three of the presenters, including the two keynote speakers, Maia Nuku and Jonathan Jones, and Michael Mel, of the Australian Museum, were people of indigenous heritage. So the audience received an insider’s view, or interpretation of the art; the view that these indigenous presenters have of the museums and their collections. Starting with the welcome to country by Uncle Allan Murray of the Metropolitan Local Land Council and Dr. Mel’s address in his mother tongue from the Mogei tribe of the PNG highlands, and later with Jonathan Jones in Wiradjuru and Maia Nuku in Maori, we were privileged to enter a space where the bonds between the art and the cultures from whence they originated became palpable. The theme of the conference, Aboriginal and Pacific Art: Collections and Artists, Then and Now, flowed through the proceedings in a non-linear, undulating process; focusing at times on specific objects before surveying the overarching stories of pre-contact life; European colonization and more recently, cultural revival. The artefacts became conduits to a much bigger story, conduits that are filled with magic as they link the current generation back through the proceeding millennia to their ancestral roots. The audience learned of the evolving role of museums and galleries from being primarily displays of colonial scientific curiosity to storehouses of cultural treasure, objects of profound importance to the source societies that are in a process of revitalization right across the Pacific. At times this process is raw and confronting, seeing just how much has been lost and damaged by European settlement; at other times uplifting as communities everywhere strive to repair and reknit their own complex societies. Certainly my appreciation of the power of Oceanic art, of what it embodies, grew. Like the brief speeches in original Pacific tongues, Oceanic art is perhaps incomprehensible to outsiders but still profoundly moving. 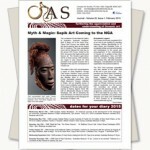 We hope to bring you reports on all the talks from the 2019 forum in coming issues of the OAS Journal, including an article by Dr. Maia Nuku, Evelyn A J Hall and John A Friede Associate Curator for Oceanic Art at the Metropolitan Museum of Art, New York in the next edition of the OAS Journal. Maia related the history of the Metropolitan and how Oceanic art (as well as African and Art of the Americas) became an integral part of that revered institution and that by doing so established Oceanic art on the world stage as a legitimate and vital part of the human story. She described how the Metropolitan has transformed over time so that now, under her active facilitation, it is reaching out to distant source communities to encourage them to re-engage with the objects in their collections. Maia’s talk was wonderfully optimistic, seeing everywhere shoots of cultural renewal and engagement, enriching not only the individuals and communities directly involved but also the objects themselves, and by association, the institutions that hold them. The Forum started in the Hallstrom Theatre at the Australian Museum in Sydney on Friday morning. Dr Michael Mel presented the first talk on The New Museum: Through the Eyes of the Holosa from Komunive. Dr Mel had been instrumental, through his work at the Australian Museum as Manager of Pacific and International Collections, in bringing down to Australia from PNG a group of men from the Asaro region, along with their famous mud masks. He related the unusual background to the recent emergence of this genre and the profound effect that the trip had on audiences in Australia and to the Highlanders themselves: they went back reinvigorated, determined to strengthen their cultural practices and ultimately establishing their own remote museum to that end. Dr. Mel’s vision of the new museum is one in which the interactions flow both ways, creating synergies, enlivening collections and strengthening traditional cultures. Suzanne Pilj, Crisin Howarth and Alex Philips (L to R), at the OAS Forum 2019 at the Art Gallery of New South Wales. Photo courtesy Jerry Liew. David Ellis, Director of Museums at the University of Sydney, told the story of the creation of two of the University’s museums: the Macleay and the Nicolson, both of which hold renowned collections due largely to the prodigious efforts of the individuals after which they are named. They will be merged into the new Chau Chak Wing Museum to form a cultural precinct on the grounds of Australia’s oldest university. In his talk David charted the intense interest in scientific and cultural objects in the early nineteenth century, their subsequent loss of appeal during the twentieth century, and the recent reawakening of interest as ‘object based learning’ takes precedence, a process that should be further empowered with the establishment of the new museum. Yvonne Carrillo-Huffman, Collections Officer at the Australian Museum, then treated forum participants to a guided tour of the recently restored Westpac Long Gallery featuring 100 of the Museum’s most treasured objects (and 100 of Australia’s most treasured people). This extraordinary mélange of human and natural phenomena is breathtaking in its diversity of colour, texture, shape and purpose, housed as it is in the original beautiful three storied museum chamber. Oceanic art in this context seems to flow from the exotic organic natural history exhibits with which it is interspersed. The art seems to have grown from nature. 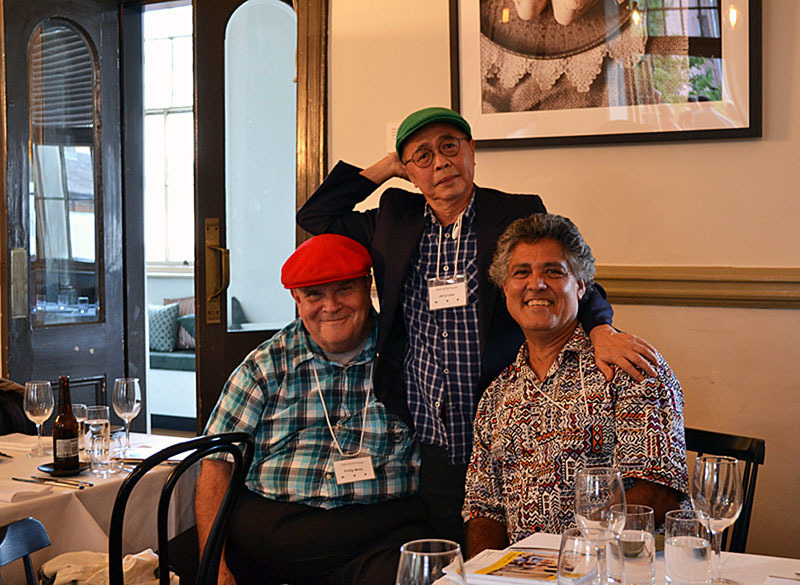 Phil Mead, Jerry Liew and Ian Wamijo (L to R). Photo courtesy Jerry Liew. After lunch Crispin Howarth, Curator for Pacific Arts at the National Gallery of Australia, in his distinctive and engaging style, explored some of the complex iconography of the art works from the lower Sepik River and Ramu River areas of PNG. Working with three significant European private collections he is contributing to a lavish publication celebrating the aesthetics of the region. Crispin managed to bridge the gap between ignorance of the precise function or purpose of an art work and the instinctive admiration that one can feel for such an object. This, to my mind, showed how Oceanic art works can transcend their cultural origins and enlist the concerted interest of outsiders. This was certainly the case for many early collectors, who are responsible for the bulk of the collections that institutions hold today. The grand old balcony of No. 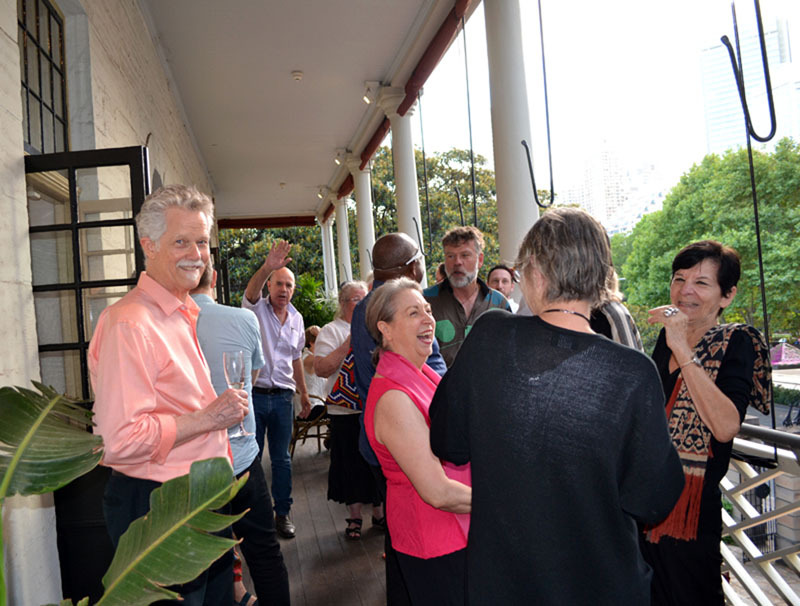 10 Bistro, Macquarie Street, Sydney, with OAS members enjoying a pre-dinner drink. Photo courtesy Jerry Liew. Jonathan Jones is a Wiradjuri/Kamilaroi artist and curator who has forced Australians to re-examine the past, often using artefacts as an artistic medium. He began his talk with a minute of silence to acknowledge the human exacerbated drought disaster that is currently unfolding along the Darling River, in South Eastern Australia, which includes the traditional lands of the Wiradjuri people. It was a poignant reminder that colonialism, or at least the impact of European settlement, is still an unfolding dynamic. Jonathan related how, as a young man, he visited the Australian Museum in search of his ancestors’ traditional artefacts only to find that they had almost all been destroyed in the Garden Palace fire of 1882. He talked of several of his extraordinary installations including the 32nd Kaldor Art Project, barrangal dyara (skin and bones) where he placed stark white manufactured shields along the perimeter of the footprint of the Garden Palace in Sydney’s Botanical Gardens as a response to the immense loss felt throughout Australia for the destruction of so many culturally significant items. Jonathan emphasized how relevant art works held in institutions are to the current generation of Aboriginal people, still reeling as they are from the colonial experience. On Saturday, after a warm welcome by Maud Page, Deputy Director of the Art Gallery of NSW, Maia Nuku gave her keynote lecture to a packed Centenary Auditorium. Following her talk Maia engaged with the audience over her vision of the role of museums and her own role, which she saw as engaging with traditional communities as much as curating the art objects under her custodianship. This did inevitably include conflicting claims, perhaps the most vexing being the issue of repatriation. Repatriation recognizes, at its heart, that original communities have not given up their sense of connection with, or in some cases ownership of, objects that are of great importance to them as cultural icons. In some cases the works are viewed as embodying specific individuals or spirits and as such retain vital energy and meaning for source communities. No doubt repatriation will continue to be a contentious subject as Oceanic art becomes more politicized. It should be addressed, according to Maia Nuku, with a case by case approach. 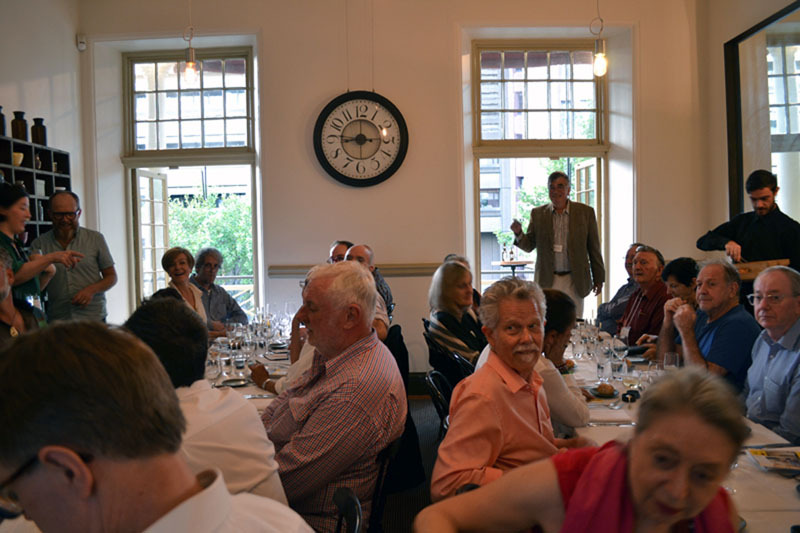 The interior of No.10 Bistro with OAS President, Bill Rathmell, addressing the dinner. The Forum then moved to topics closely aligned with the AGNSW. During the course of the next three lectures the influence of the Art Gallery’s former Deputy Director, Tony Tuckson, become evident. A skilled painter himself Tuckson showed an interest in and an admiration for Aboriginal and Oceanic art that left a lasting legacy. The AGNSW has particularly strong collections of Aboriginal and Melanesian art largely thanks to Tuckson’s early enthusiasm, a corollary being specialist curators who are experts in their respective fields. Cara Pinchbeck, Senior Curator of Aboriginal and Torres Strait Islander Art, gave a stunning presentation on The Singular Vision of Nongirrna Marawili. The Gallery is currently exhibiting works from the artist in a show entitled from my heart and mind. Cara told of the unusual evolution of Nongirrna after the death of her husband, Djutjadjutja Munungurr, an important painter himself. Nongirrna’s father, Mundukul, had been seminal in the evolution of bark painting at Yirrkala after working with anthropologist, Ronald Berndt in 1947. When Nongirrna started painting, influenced as she was by her husband and father, she was heavily constrained in her range of subjects as stories were owned by individuals, generally men, and could not be reproduced by the unauthorized. In some ways this seems to have spurred her to greater creativity as she navigated customary law and came up with her own unique interpretations of her country and culture. The results are spectacular and reinforce the point that Oceanic art is not confined to the ancient past but is still being produced with the greatest virtuosity. Denise Mimmocchi, Senior Curator of Australian Art at the AGNSW, then delivered a lecture entitled, Tuckson: the Abstract Sublime. An exhibition of the same name is currently showing at the gallery. Denise’s talk and slide presentation made the connection between Tuckson’s vibrant abstract works and the tribal art that he so admired. They are both steeped in unknowability; symbols that remain impenetrable without explanation but still somehow inherently powerful and intriguing. Tuckson proved to be a difficult subject for researchers and biographers as he wrote little about his work and gave few interviews before his early death in 1973 at the age of 52. His seminal collecting trips to Arnhem Land with the great benefactor and Aboriginal art admirer, Dr Stuart Scougall, were, however, well documented by his wife (and former OAS member) Margaret Tuckson. So too was his friendship with Melanesian art enthusiast, Stan Moriarty, much of whose collection is now in the AGNSW. Tuckson left a strong and enduring legacy: both in his own highly admired works and in the institutional strength that continues today in the fields of Aboriginal and Melanesian art. Natalie Wilson, Curator of Australian and Pacific Art, AGNSW, expanded on Tuckson’s legacy with her presentation on Melanesian Art: Redux, another exhibition currently gracing the gallery’s walls. Natalie has curated this show as an act of homage to Tuckson for his 1966 AGNSW exhibition Melanesian Art, which was one of the first public shows of Oceanic art by a major art gallery in Australia. Some of the works from the original show are featured in the current one and display techniques (no labels) and placement that mimic Tuckson’s. The accompanying Exhibition Guide, however, is somewhat more detailed than the original as Natalie ventured to the Sepik River, retraced Tuckson’s 1965 collecting trip, and researched individual pieces in source villages. The 1966 show also contained material from a variety of other institutions, including the then Territory of Papua and New Guinea Museum, and private collectors, such as Stan Moriarty. 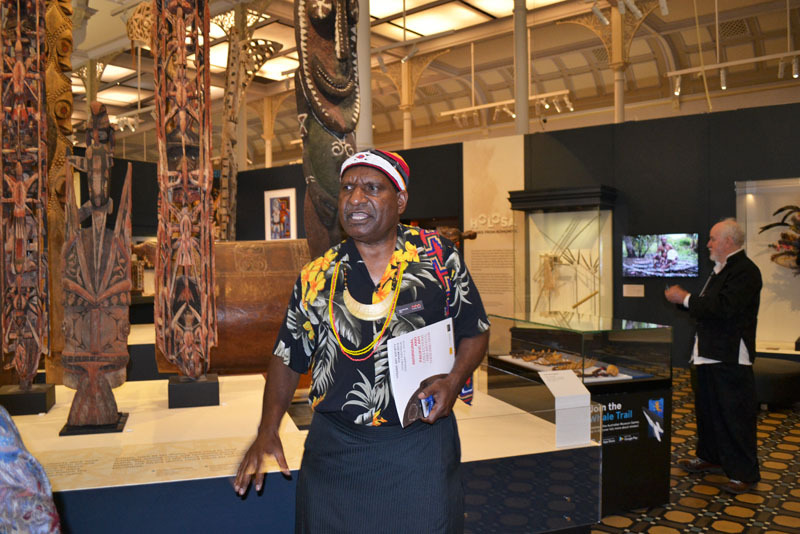 It was a ground-breaking exhibition as it presented Melanesian art for the first time in Australia as an important and integral part of human artistic endeavour. Dr Michael Mel giving a tour of the Australian Museum Collection, OAS Forum 2019. Photo courtesy Jerry Liew. Natalie presented an exhibition tour of Melanesian Art: Reduxthe next day, which allowed us to see in the flesh many of the objects discussed in her lecture. It seemed to me that these artefacts had acquired an added allure through their association with Tony Tuckson, Stan Moriarty, the heady days of the 1960’s Sydney art scene and being in the vaults of the AGNSW for over 50 years. Also on Sunday a series of fascinating films were screened: The Black Heart of New Guinea (1925);Talkabout, the Australian Territories, Baining Fire Dance (1963);Bugla Yunggu: The Great Chimbu Pig Festival (1972), and Stolat (1985). Following this was the Tokelauan Group from PNG performed a series of spectacular traditional songs and dances in the Entrance Court. The social highlight of the OAS Forum 2019 was the dinner at the No. 10 Restaurant located at the old Mint building on Macquarie Street, a few minutes walk from the art gallery. This beautiful old venue hosted some 50 forum participants in a dedicated first floor room that opened onto the wide colonial balcony. The night started with Esther Jessop QSM giving a blessing to the event in Maori, after which she was joined by her daughter, Maia Nuku, in performing an impromptu singing routine, also in Maori, that captivated the room and put a smile on everyone’s face; setting the tone for the evening. The night concluded when Michael Mel coached an eager throng on the stately balcony in the finer aspects of a traditional New Guinea highlander’s vocal farewell. In response to Michael’s deep sonorous call (one could imagine it echoing across a jungle-clad highlands valley) the crowd responded with its own lower pitched resonant reply; the two calls creating their own rhythm with repetition; the supplicants necessarily jumping to the beat before the all-powerful dance master. Fortunately Michael called a halt before the 208 year old balcony fell off, although I think he cut it pretty fine. 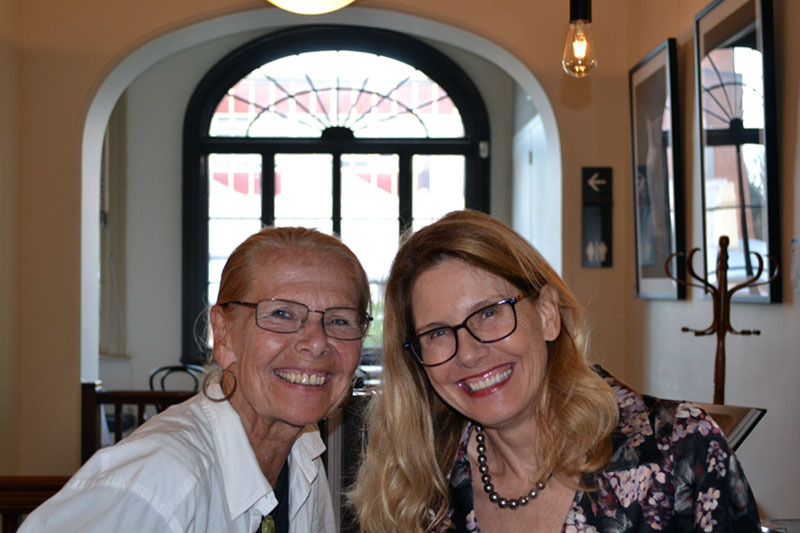 The OAS Forum 2019 Aboriginal and Pacific Art: Collections and Artists, Then and Now was a huge success. It drew many strands of the Oceanic art milieu together: curators; artists; academics; collectors; researchers. This is sometimes not an easy mix, although all share a strong connection/love/respect for these important objects and the extraordinary meaning and history which every single one embodies. While the objects themselves remain unchanged, whichever display case or air-conditioned vault they may inhabit, the world around them changes; how they are viewed; their importance, changes, is changing. Events like this forum reflect these changes, and seeks to understand them, which proves a deeply enriching and profoundly satisfying intellectual endeavor. Welcome to Country: Uncle Allan Murray.